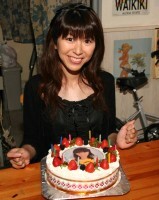 There was a birthday event for Nagai Noa on August 6, 2006, at Chaku Chaku (the restaurant above Live Inn Magic). It was a lunch party and a "talking with Noa" event. There was also a birthday cake decorated by a photo of Noa. There were around 10 people who participated. I made two DVDs of Noa's singing events (during her Kira Melo days and solo songs in Kome Iijan), and that was played on the TV screen in Chaku Chaku.